Our March 2019 Artifact of the Month is a Wright & Ditson No. 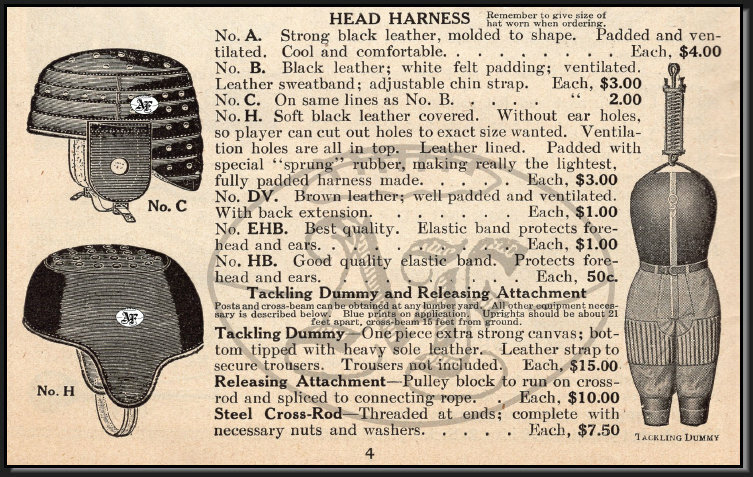 H, first generation Harvard-style head harness manufactured between 1915 and 1918. Our example first appeared in the Wright & Ditson Fall & Winter catalog in 1915. It was designed as a lightweight alternative to more substantial helmets introduced in the 1910's. The No. H sold for $3.00 and included several novel features. 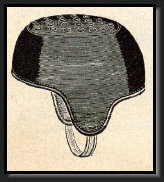 The crown of the helmet contained a special "sprung" rubber padding sandwiched between the leather inner and outer shells. Another unusual feature was that the No. H was sold without factory cut ear holes. Wright & Ditson suggested that the ear holes could be custom cut by the owner to "the exact size wanted." Our example's ear holes are somewhat roughly cut, suggesting that the original owner cut the holes after purchase. The exterior leather is soft and supple with minor creasing and cracking. The interior leather shell exhibits more significant spalling and tears and the chinstrap is missing. The helmet is a small adult/large youth size. The Harvard head harness is a relatively rare style with only a handful of examples coming to market over the past 10 years. In 1915, A.G. Spalding, Wright & Ditson, and Reach each began manufacturing leather flattop top football helmets commonly referred to as the "Harvard-style," being the style preferred by the Harvard Crimson. While this term did not appear in catalogs until the mid-1920's, each of the manufacturers named their model the No. H or the No. 1-H, with the H presumably referring to Harvard. The Harvard was a lightweight all-leather helmet constructed out of three pieces of leather, one for either side of the helmet and a third to form a flat top. By the mid-1920's, manufacturers introduced the second generation Harvard Flattop, which added two pieces of reinforcing leather longitudinally and laterally across the top of the crown.